Arthur Aberlin explains the importance of the ceremonies reserved to those who have fallen in the battles, to gather people in grief but also to give strength and to remind the fighters what they are fighting for. It’s my second time assisting to a ceremony dedicated to the shehiden (martyrs) since my arrival in Rojava… The first time was quiet moving already. 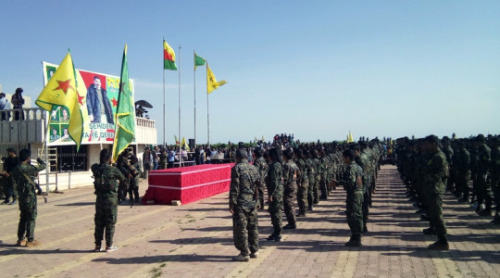 But this time was even more emotional, first of all because of the high number of buried martyrs (20) and because of the symbolic of their deaths, since they hadn’t been victims of Daesh, but of the bombings of the fascist Turkish state on the headquarter of the YPG-YPJ forces in the canton of Afrîn. I can hardly describe the atmosphere and the feelings you get when you take part in such a ceremony, lost in a crowd of 6000 people who have come to honour the fighters that have lost their lives defending this revolution. Such moments are at once loaded with sadness and filled with strength and courage, and, paradoxically, a kind of joy. People come from everywhere, from all communities, Syriac Christians stand next to Muslims, Yazidis, etc. And all of them gather to pay tribute to those who have fallen. Of course, I don’t want to idealise such events. One can easily see that the communities don’t really mix up, but I think that the fact that they get together in the same place for the same cause is meaningful here. From a Western point of view this cult of the martyrs can seem repulsive… but from what I understand, this is a way of materialising the slogan “sehid namerrin” (“the martyrs never die”). They don’t die because the fight for the cause (confederalism) goes on. This gives courage… and you need plenty of it if you’re up to face the fanatics from Daesh or the eighth world army (Turkey). It’s really hard to imagine when you haven’t experienced it, but these events are a million miles away from the stilted and deadly ceremonies we know from our States. Here, it all makes sense, there is no separation between fighters and people, we are united. There is none of this cold distance that exists between all mercenary State armies and the people they pretend to defend… Here, we merge together, we mix up, we hug, we discuss, we share water, this precious element during these hours under the burning sun. People are also flirting, in a discrete way... the gathering feels like a revolutionary merry mess – in fact, it is full of life.